Harbor tug services are available from direct owners. The Tugboats with 30 bollard pull to 50 bollard pull are available from direct owners for long term time charter with in harbor operations. 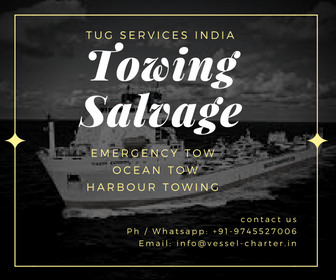 The Tugs services for round the clock at ports for berthing and unberthing, towing of the vessel, emergency fire fighting and all other port / harbor operations. Interested clients do contact us with their genuine and authentic requirement. You can leave your requirement and contact details in the comment box also.